The first dynamic is the results your company produces. Your business needs to be able to achieve your financial targets for revenues, profit, growth, compensation, or whatever metrics are meaningful to you. The second is your company culture. Your people need to rally around your vision and align with your company’s core values. They need to interact with customers, prospects, and each other so that the culture reflects how you want your company to act. These two outcomes—financial performance and a values-based culture—form the foundation of a self-sustaining business. Once you’ve made the choice to transform your company from one that operates because of you to one that operates without you, the rest of the work lies in ensuring consistency and predictability in both results and behavior. That’s what well-crafted systems will do for you. 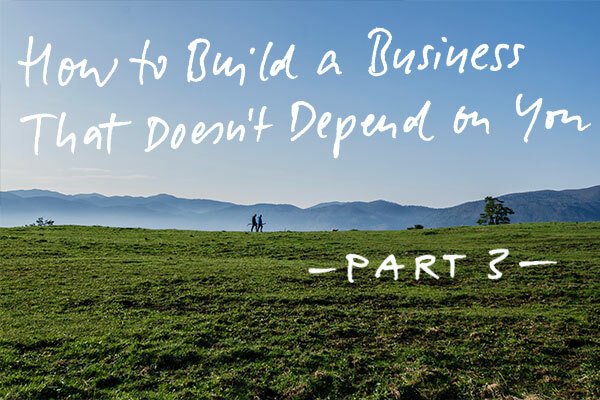 Last week, in Part 2 of this series, I wrote about the fundamental shift every business owner needs to make from thinking about their product as “the commodity we sell” to recognizing that the business itself is the product. Making this shift from Technician’s thinking to Entrepreneurial thinking is the most important way you can prepare to build a business that doesn’t depend on you. The entire network of systems that make up your business is your way we do it here—your proprietary way of acquiring customers, serving them, and supporting your employees. Creating your way we do it here also requires a parallel shift in the way you spend your time. While there may be some tactical functions you want to perform personally—like sales, copywriting, training, etc.—you’ll have to replace yourself in others, one at a time, so you can free yourself to work on your business not just in it. Once you’ve shifted your thinking to a more entrepreneurial perspective, you’ll start to see opportunities to replace yourself that you never imagined, and time to work on your business will seem to show up out of nowhere. The essence of your way we do it here lives in the systems you design to produce the results and culture you envision for your company. Systems are the solution to a business that works because of you. The reason is simple: When you turn your experience getting things done into a step-by-step process—one that you can teach to your employees and refine over time until it produces results equal to or better than your own—then your company can produce consistent, predictable results without you. Today, there are more than 50 coaches and salespeople at EMyth using our Sales Process to acquire clients. This is one process I’ve personally worked to evolve since I joined the company as an entry-level salesperson in 1982. For five years, I learned how to sell coaching, and since then I’ve poured everything I know back into the Sales Process and continued to refine it so others could learn it, trainers could teach it, and people could be supported by it to produce exceptional results. Since 1987, I’ve trained salespeople because it’s something I love to do and I haven’t made a single sale myself. Sales, or what we call Lead Conversion at EMyth, is one of seven essential functions that can be systematized in any business and in any industry. The other six are: Leadership, Marketing, Finance, Management, Lead Generation, and Customer Fulfillment. Building, testing, and continuously improving systems in each of these areas will give you choices about how you spend your time inside your company and how much time you spend away from it. The steps of any process (what you do first, second, third, and so on) are only half of what makes a system. The other half is how to navigate those steps—what we call standards. Standards play an important role in supporting your employees to achieve your company’s objectives without you. Standards make expectations clear, allowing employees to perform better and experience more satisfaction in their work. These are found in Position Agreements, which you may ask your employees to commit to and sign when they join your company, change positions laterally, or get promoted to a new position. Position-specific standards are both qualitative and quantitative. Sales Associate will participate in regular trainings in Company’s Sales Process as required by the Sales Manager. Sales Associate will follow Company’s Sales Process in all conversations with prospective customers. Quantitative standards are minimum levels of performance. They’re the result of analyzing data, collected over time, about the performance of team members—including you—holding Lead Generation, Lead Conversion, and Customer Fulfillment positions across a range of metrics. By definition, a self-sustaining business is a metrics-driven business; it’s a business that intimately understands the performance of its processes, teams, and individual employees. Once your salespeople are following the same Sales Process—your way we do it here in Sales—these metrics can be turned into standards, forming your assessment of the minimum results you expect your salespeople to achieve. You might determine from the data that it’s reasonable to expect your Sales Associates to speak with 97% of the customers who come into your store, and that 45% of the 97% will make a purchase of $22.58 on average. This is how standards drive performance and results produce predictability. That predictability is the key to a business owner’s freedom. It’s pretty easy to see how systems in a business can provide structure, eliminate chaos and overwhelm, improve performance, and enhance customer satisfaction. In a landscaping business, for example, the person who writes up the estimate and makes the sale is often separate from the crew that provides regular yard maintenance. A system that effectively communicates the customer’s wishes and the salesperson’s promises to the field would provide all of the above benefits. The way that systems transport your values into the culture of your company is less obvious. Your Leadership, Marketing, Finance, Management, Lead Generation, Lead Conversion, and Customer Fulfillment Systems should reflect, wherever they can, your values: how you want to position your company; how you expect your employees to treat prospects, customers, and each other; and how you expect results to be produced. Take your Recruitment and Hiring System, for example. Its primary purpose should be to attract employees who are excited by your vision and resonate with your company values. To do that, the system needs to include a way to clearly communicate to candidates what your company stands for, as well as opportunities to identify candidates who are the best cultural fit. What would a job posting that reflects your company values look like? What interview questions would you ask to gauge a candidate’s alignment with your vision? How would you design your interview process so that candidates receive an unmistakable picture of what your company cares most about? Clear standards inspire employees who align with the company culture to perform at their best. Once expectations are unmistakable, your standards will also identify employees who no longer fit the culture you’re creating. That can be painful in the short term, but it’s also the inevitable consequence of building a systems- and values-based company. To create a business that doesn’t depend on you, you need a culture that is both cohesive and diverse. All employees will follow the Company’s Voice and Tone Guidelines in all written communications with customers, and prospective customers and will be approved by the Director of Marketing. The more you let your values seep into your systems, the more you’ll be inspired to build those systems, the more fun you’ll have creating them, and the more likely it is that you’ll notice your company culture reflects what you care about but doesn’t depend on you to thrive. If you’re at the place in your business where it’s time to start thinking seriously about how to make it operate without you, this is the work that needs to get done. It’s a commitment to work on your business not just in it. It takes time; but it’s gratifying, and the rewards are really worth it. The final blog in this series—Part Four—is about leadership: what it takes to replace yourself with capable leadership and how I’ve navigated those waters in the last 18 years. I hope you’ll join me then.